Gearing up for annual report season, Getty Images wanted to address the fact that sales for Rights Managed (RM) imagery in the annual report/financial report category had dipped 17% over the previous year. Getty sought to increase revenue via existing clients and by gaining new accounts. Music was a new offering for them, and since there was a trend for companies to share annual report information online, an additional goal for this campaign was to cross-sell film, music and photo assignments services. Getty planned to offer a discount to those who hadn’t purchased RM in the past to help offset their client’s budget cuts, which were prevalent at that time because of the 2008 economic crisis. We developed an integrated campaign which included direct mail and email that drove people to a microsite. The campaign’s concept was based on the Stimulus Act of 2008. The intro to the microsite described how an annual report can stimulate its various stakeholders and then segued into what Getty Images can stimulate — cost efficiencies via the promotion — as well as creativity, because agencies could afford higher quality photos and multi-media. We researched annual report themes and created dynamic multimedia “books” using relevant still images, footage and music and then included links to the theme search term on the Getty Images site. This integrated campaign was a great success, driving an over 20% increase in sales to this target market. For this project, we presented two concepts: “Make it work” and “Stimulate possibility,” with ideas for how the concepts could unfold, featuring compelling Getty Images visuals. Ultimately, the client chose “Stimulate Possibility,” but both ideas were well-received. 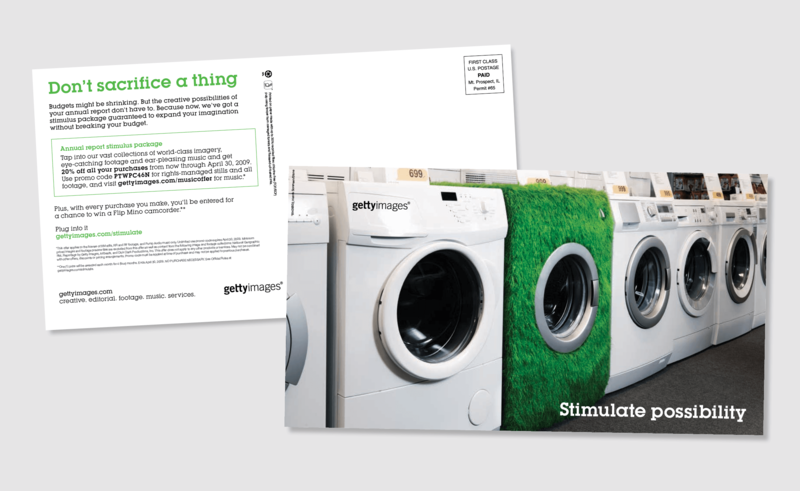 The direct mail component consisted of attention-grabbing oversized postcards that featured an arresting image, the offer and a link to the microsite. Want to find your perfect match for a marketing partner?